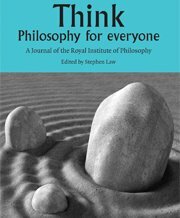 I am looking for contributions to THINK: Philosophy For Everyone, which is a journal of the Royal Institute of Philosophy published by CUP three times per year I'm the editor). Pieces must be 4k words max and very accessible and clear. No endnotes or footnotes and minimal refereneces. Mostly we publish stuff by professional philosophers but do include other pieces too if they're good. I also encourage unusual approaches, such as using dialogues. If you have a piece or an idea that might be appropriate let me know. If you're a professional philosopher with a short piece for which you hold copyright that would be suitable, do please send it over. Word documents sent as attachment to my email address (see the title bar above) are best, please. sorry to ask but what's the email address at which i can send my idea.